This is a lower-calorie diet with a difference - it's based on hunger-satisfying portions of delicious, lower-calorie dishes that taste amazing. The focus is on the food that we can and should be eating to lose weight, which is easy to make and won't make you feel as though you are missing out. 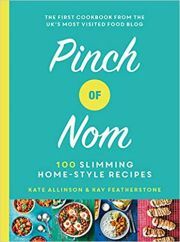 Recipes include warm halloumi salad; salt and pepper squid; sweet potato and black bean burritos; sticky pork chops; and baked doughnuts with sweet five-spice dust.